Here’s an easy recipe for using up bananas that have become too ripe. 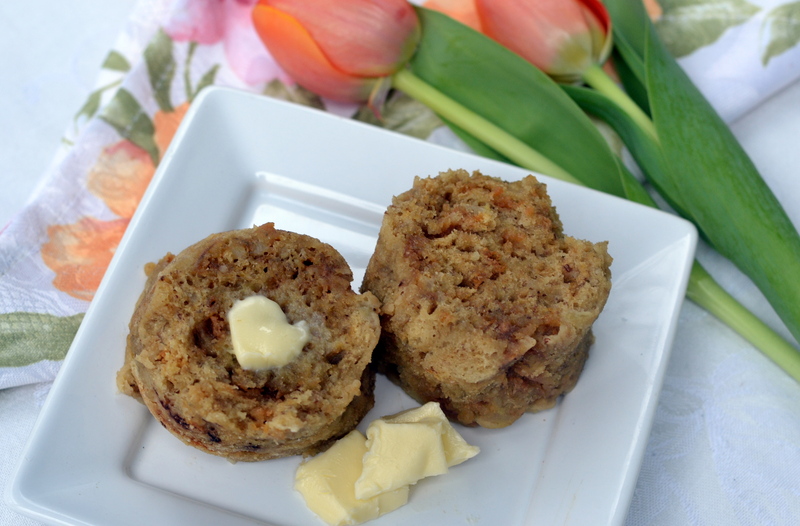 I usually have several over-ripe bananas in the freezer ready for banana mug muffins or a breakfast smoothie. Ready in five minutes, this easy version of banana bread serves one. You simply mix the ingredients up in a microwavable mug and pop it into the microwave. As you know, Glenn and I are lowering our carb intake these days. Now I know banana is usually on the hit list for low carb dieters but we still eat a small amount of banana now and then. If you are watching your carb intake, this mug muffin will add 9.9 G of carbohydrates in total to your daily count. Place banana in a microwavable mug and mash into a smooth paste. Add the egg, melted butter & vanilla and mix all the wet ingredients together with a fork until well blended. Now add the rest of the ingredients (PB2 powder, coconut flour, baking soda and salt) and using the fork mix everything together right in the mug. Microwave on high for 1 1/2 – 2 ½ minutes. My microwave is 1000 watts so I use the shorter time. For those who prefer to use an oven: Pre-heat oven to 350 F and bake the muffin for 15 minutes.